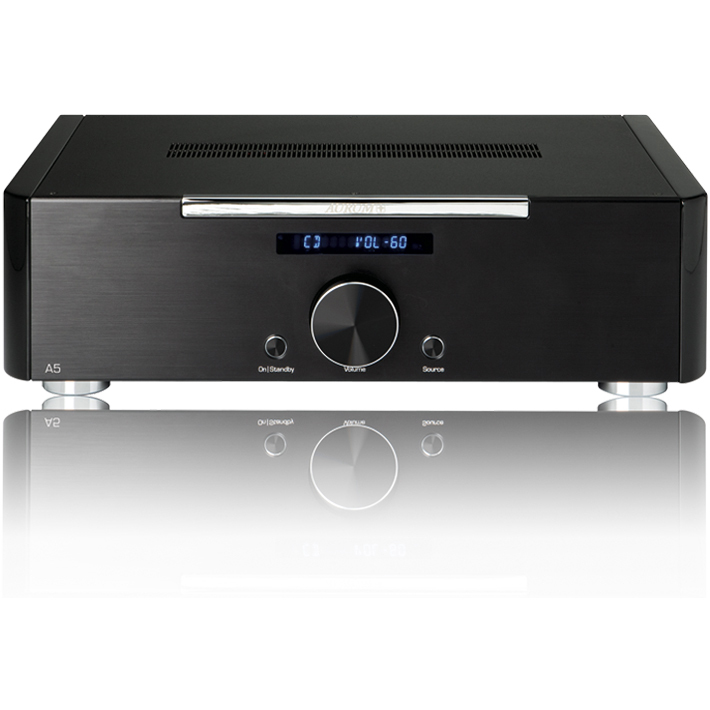 The Aurum A5 is Aurum’s flagship integrated amplifier. Featuring 9 analogue inputs, and 100W/channel output power (150W into 4Ohm Speakers). This amplifier is built as two monoblocks in the one box (see image), with astounding attention to detail to the quality of operation. Solidly built in Germany ! Finish – Black with a choice of side finishes, Gloss Black, Light Oak, Choco-Oak. Input switching using premium encapsulated signal relays with gold-plated contacts for optimal signal transmission. The relays are virtually wear-free and have an extraordinarily long life. For the input stage, AURUM developers use BI-FET operational amplifiers, making AURUM amplifiers especially low in noise and distortion. They also transmit a very broad frequency response. The result is a significant increase in music reproduction dynamics. 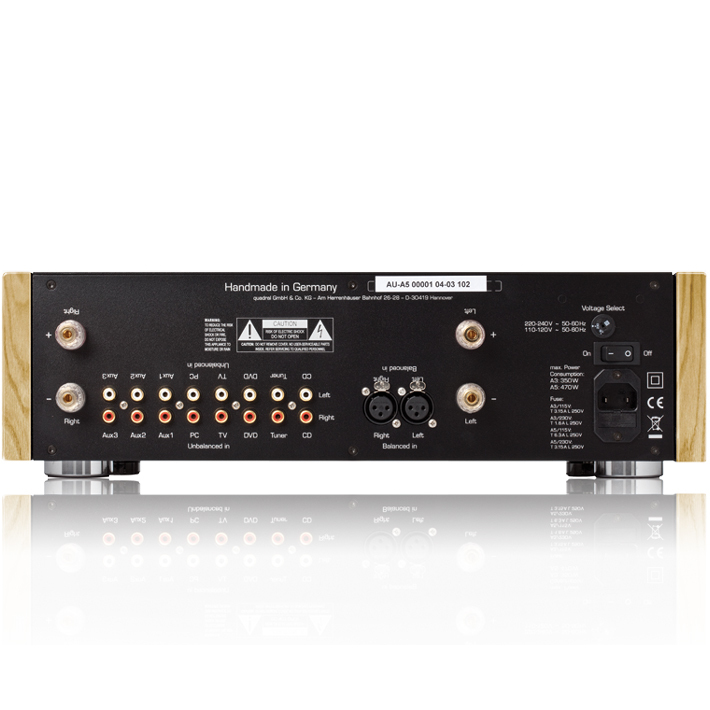 Aurum A5 amplifiers are equipped with studio-quality volume control switching, which makes for precise logarithmic volume setting capabilities. This guarantees that the right and left channels are set to exactly the same volume. 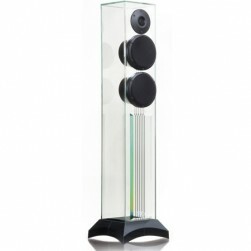 Compared to previous technology, this sophisticated technology has the advantage of greater dynamics when playing music. For the signal paths, our engineers exclusively use premium German-made polypropylene film capacitors, no lossy electrolytic capacitors. This type of signal transmission very effectivel y minimizes distortion. 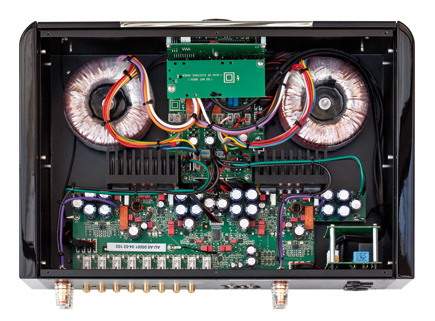 The broader a band an amplifier works with, the more captivating its sound characteristics. Unfortunately, many manufacturers avoid broadband music reproduction, because radiation and vibration make these devices very interference prone. A specially developed passive output filter with a unique handwound coil decouples the speaker from the output stage, thus allowing the AURUM amplifier to operate in broadband without interference. Previous speaker relays had a natural tendency to wear, which usually led to the speaker channels losing volume or even failing over time. AURUM engineers use a vacuum-welded output relay with a special alloy that prevents this from happening. The Aurum A5 Standby eco-adapter consumes less than 0.9 watts of power. The transformers have been developed especially for the Aurum A5 Electronics. They use innovative spot welding technology and minimize the power adapter’s electromagnetic field. 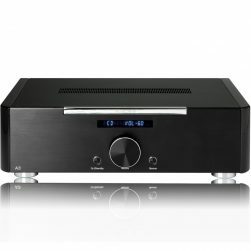 This allows the output stages to operate trouble-free, and all Aurum A5 amplifiers to have the same fascinating sound. • Symmetric disturbances are in every power grid, and asymmetric disturbances through a device’s housing or mass negatively influence an amplifier’s acoustic behaviour. However, these are eliminated by broadband power filters, guaranteeing the greatest possible music enjoyment. Another special filter prevents annoying hum from the toroidal transformer. Discretely designed rectifiers with 200A ultra-fast recovery Schottky diodes guarantee the amplifier’s interference-free operation. Five separate electrolytic charging capacitors per channel with a specially developed circuit ensure fast power delivery. 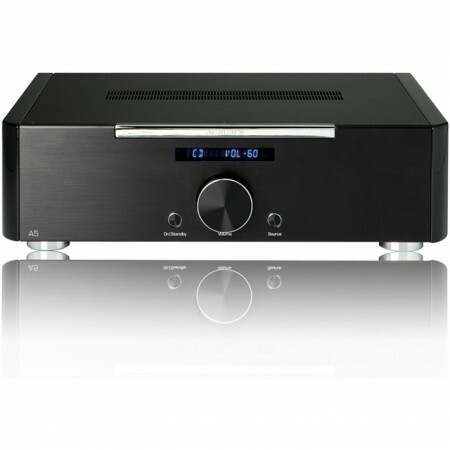 This means that AURUM amplifiers play effortlessly even with fast and high impulses. In Aurum A5 amplifiers, the protective circuits are not in the signal path, which distinguishes them from many competitors. This principle makes sure the sound is not influenced by the protective circuits. Ordinary protective circuits limit the current flow early, which leads to bad sound, because the amplifiers have low energy reserve. A dynamic protective circuit developed for AURUM amplifier protects the power amplifier. Thus the three various output sizes are continuously measured and matched to one another. This protective circuit allows the amplifier to work with higher current flows. That leads to dynamic sound with true detail. Additionally, several sensors measure the temperature and switch the device off during overheating and secure it against switching back on. A further protective DC circuit prevent your loudspeaker from malfunction caused by d.c. voltage at the output stage. 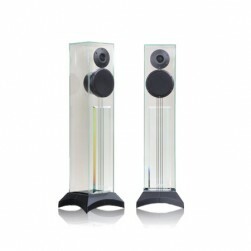 The development engineers have created the Aurum A5 as a true dual mono construction. That means that each channel has its own power supply, its own signal processing, and its own signal amplification. Therefore the channels can operate interference- free and independently of each other. The increased power, dynamics and energy reserves pay off in stable, highresolution sound. For a strong power supply, the A5 is designed with two separately operating, low-leakage main power adapters, transformers and rectifier lines. For the sensitive input stage, we use low-noise audio operational amplifiers from Analogue Devices. Besides optimal signal transmission, the Aurum A5 offers the benefits of balanced input (XLR). This process allows signal transmission with an earth conductor that carries no signal flows.